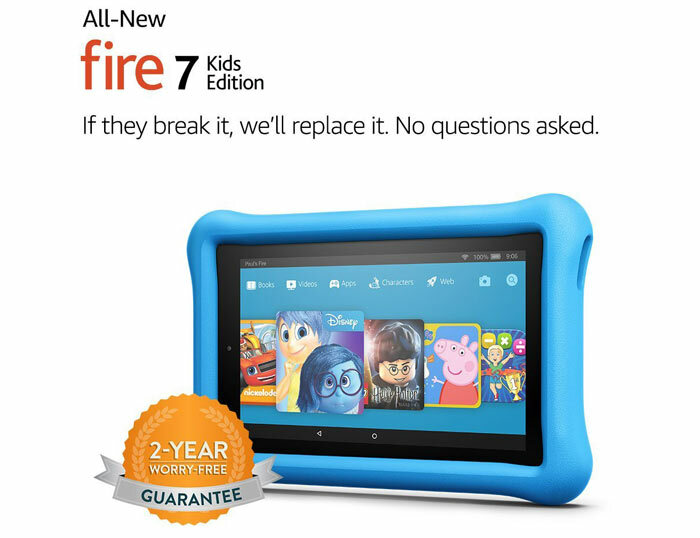 Amazon has updated it popular Fire 7 and Fire HD 8 tablets with all-new editions featuring Alexa, plus rugged Kids editions with free FreeTime content subscriptions (for 1 year) plus extended no-questions-asked guarantees. As usual Amazon's device numbers signify the screen size. The all-new Fire 7 is said to provide an improved IPS display "with higher contrast and sharper text". In further tweaks to the design Amazon has made it thinner and lighter. Despite the size and weight shrinkage Amazon promises extended battery life: the Fire 7 can now provide up to 8 hours of mixed use. Users should also enjoy faster Wi-Fi connections says Amazon. The Amazon Fire 7 with Alexa packs 8GB/16GB of built-in storage with users able to add up to 256GB more via microSD card. Inside there's also a 1.3 GHz quad-core processor, and 1GB of RAM, quite low nowadays. It retails from $49.99 / £49.99 (8GB version, with 'Special Offers') and is pre-orderable today for delivery from 7th June. 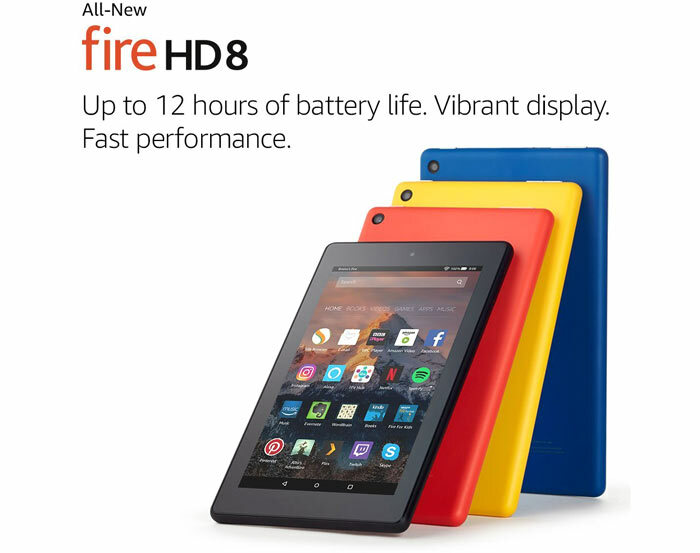 Amazon's all-new Fire HD 8 provides quite a few significant advances over the smaller entry-level tablet. The new 8-incher takes over where Amazon's highest customer-rated tablet left off providing faster performance, a vibrant screen, and up to 12 hours of battery life. Dolby Audio helps you enjoy your tablet content. Inside you will find a 1.3 GHz quad-core processor, 1.5GB of RAM, and a choice of 12/32GB of built-in storage with card slot to expand this by up to 256GB. Again there are price differences depending upon the amount of built-in storage and whether you want special offers or not. The entry level 16GB model with special offers costs $79.99 / £79.99 and hits availability on 7th June. 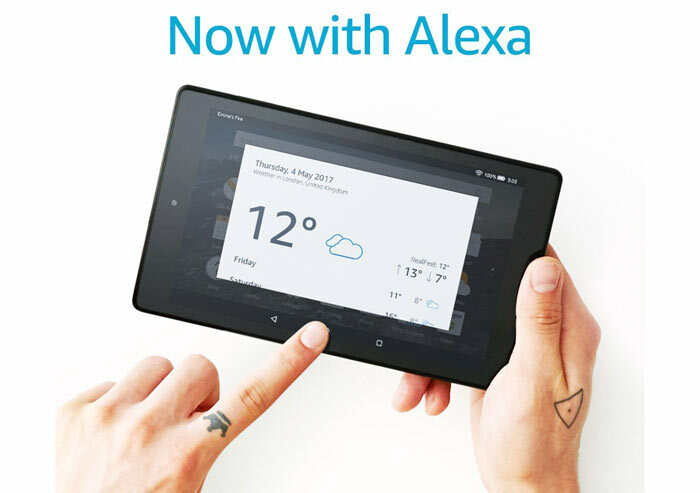 Both of the above tablets feature the Alexa assistant, greater durability than Apple's iPad models, front and rear cameras, dual-band Wi-Fi support, Amazon ecosystem convenience features, and are available in a number of case colours. 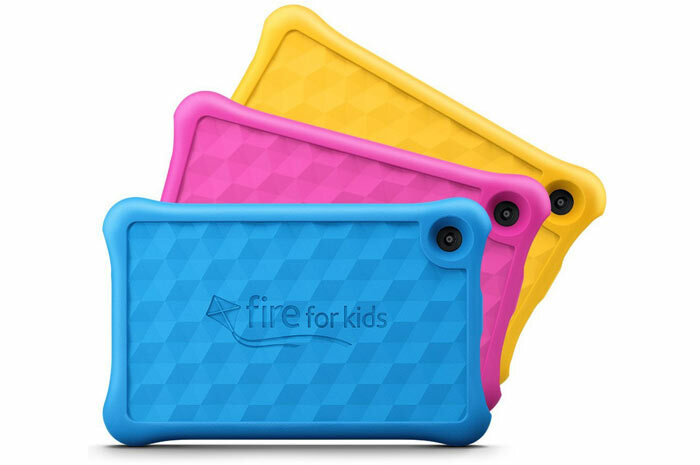 The all-new Fire 7 Kids Edition and all-new Fire HD 8 Kids Edition appear to be the same tablets as above but with a number of child-friendly adaptations. These push up prices significantly but might be worth it for you. Firstly the Kids editions are ruggedized but this means they are a bit heavier. You can see how the case looks like a thick bumper wrapping round the edges of the tablet. Add to this an exceptionally worthwhile sounding guarantee: Amazon promises "a two-year worry-free guarantee - if they break it, send it back and we'll replace it. No questions asked." Secondly there's a combination of comprehensive parental management tools and an included Amazon FreeTime subscription (1 year). FreeTime provides access to "over 5,000 popular apps and games, videos, books and educational content from Disney, Nickelodeon, Sesame Street and many more". However there's no Alexa with these kids tablets. The all-new Amazon Fire 7 Kids Edition and all-new Fire HD 8 Kids Edition cost £99 and £129 respectively, again from 7th June. They pack 16GB and 32GHB of storage respectively, there aren't any 'special offer' ads with these. Amazon currently has an offer that if you pre-order any three all-new Fire tablets you can take 20 per cent off the total price.